Sunscreen's effectiveness against sunburn is measured through the SPF (Sun Protection Factor) scale. Originally started by the chemist Franz Greiter in 1962, it is now the global de facto measurement for UVB ray protection in a sunscreen. Most people are just happy to select a sunscreen with a high protection factor and be done. Not many choose to find out what this protection is that they are actually buying. SPF measures UVB protection only, not UVA. What exactly is the Sun Protection Factor? A little more practically put....it measures the length of time a sunscreen product will protect the skin from reddening after exposure to UVB rays, compared to how long the same skin takes to redden without any sunscreen protection. More specifically, if your skin takes 20 minutes without any protection to begin reddening, using an SPF15 sunscreen theoretically prevents reddening 15 times longer ie. 5 hours. 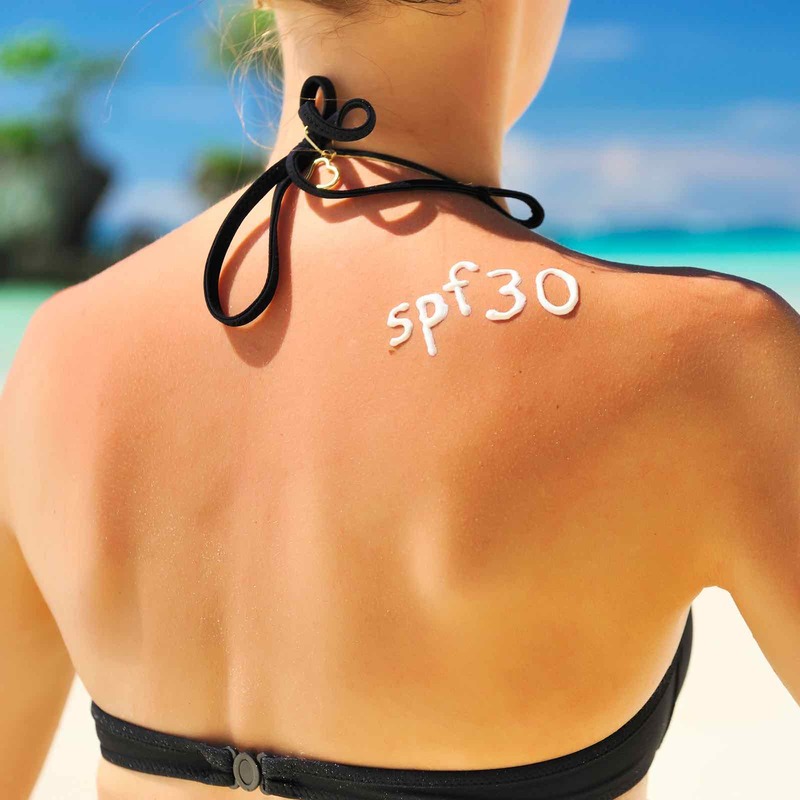 An SPF30 will be 30 times longer ie. 10 hours. However, there are many complexities involved and no matter what the Sun Protection Factor, for best protection, it is almost universally recommended to reapply the sunscreen every two hrs or immediately after swimming or heavy sweating. I find one of the main confusions when it comes to understanding what you're buying in a sunscreen, is just how your sunscreen protects you from the UV light. Ultraviolet (UV) is an electromagnetic radiation with a wavelength from 10 nm to 400 nm. In the UV spectrum this is shorter than visible light and longer than X-rays. 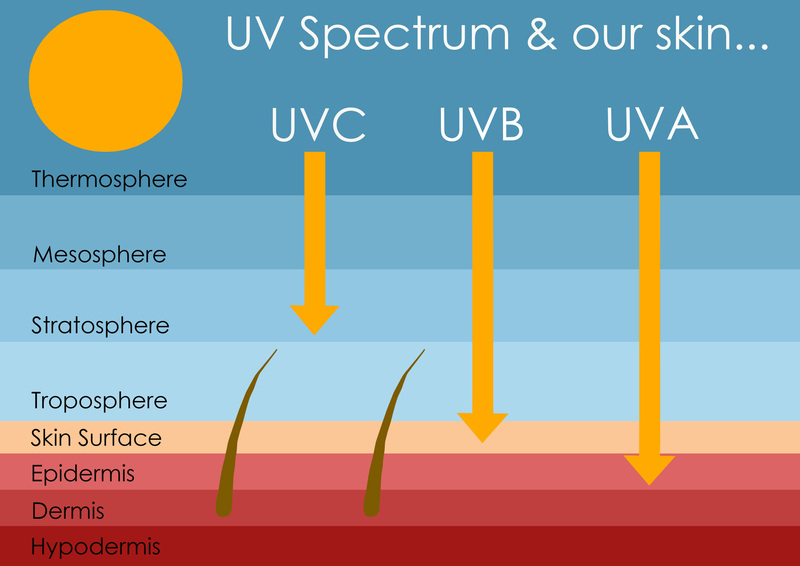 So UVB, being the shorter in wave-length, will burn the skin at the surface, resulting in the visible sunburn we are familiar with. But UVA will cause far deeper damage. Knowing you are wearing a sunscreen with high UVB (ie. high SPF) protection, keeps people in the sun longer than they would ordinarily be and in turn greater amounts of the deeper penetrating UVA is received. Thus, protecting against both UVA and UVB becomes of paramount importance. This is known as 'broad spectrum' protection. 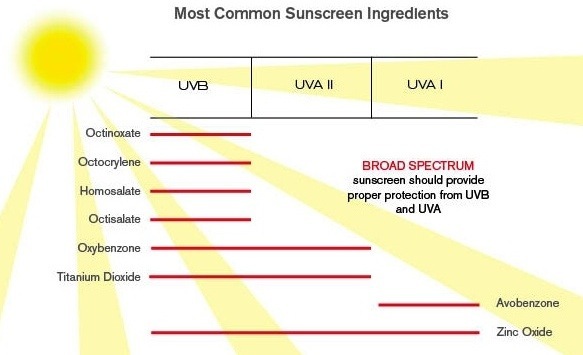 "Broad spectrum" indicated on a sunscreen requires that it has been certified for sun protection against both UVA and UVB. It is very important to note that it does not guarantee protection against all the UVA wavelengths, however. Most broad-spectrum sunscreens with a Sun Protection Factor of 15 or higher do a good job against UVB and the short UVA rays. However, only if they contain avobenzone, zinc oxide, or titanium dioxide, are they able to be effective against the wider UVA spectrum as well as UVB. See the table below for a good view on the effectiveness of various sunscreen active ingredients.